Chicken thighs stuffed with Stove Top stuffing and baked with prepared gravy make for a super easy weeknight meal. This casserole is the mother of easy recipes. Y’all asked me for easy casserole recipes and I think I delivered on this because it don’t get no easier than this. It’s so easy it’s almost embarrassing. And y’all are going to laugh at me but I didn't know where to find Stove Top or a jar of gravy in the grocery store and had to ask for help. Twice. I wouldn't pull this out if the boss was coming to dinner but for a quick weeknight supper, it was spot-on! And the onions totally gobbled it up. Prepare stuffing mix per manufacturer’s instructions, cover and set aside. I've used traditional and cornbread stuffing in this and love them both! Spray a 13x9 casserole dish with cooking spray. Trim excess fat from chicken then season both sides with salt, pepper and garlic. Place about 1/4 cup of stuffing mix on each piece of chicken then wrap sides around to create a little bundle. Place bundles in casserole dish. Spoon remaining stuffing into casserole dish around chicken bundles. Cover dish with aluminum foil and bake at 375 degrees for 20 minutes. Remove dish from oven. Remove aluminum foil then continue cooking, uncovered, for 15-20 more minutes or until chicken is cooked through. 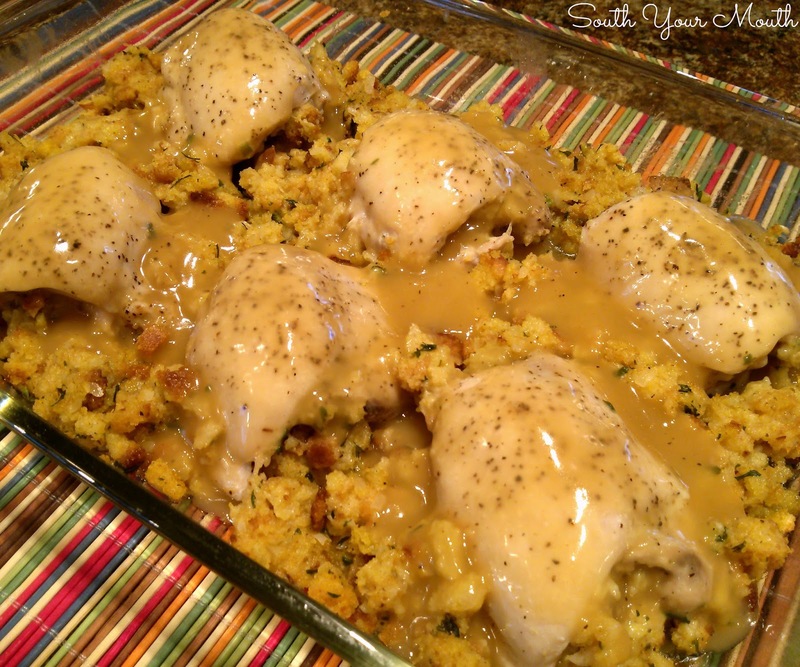 Pour gravy over chicken and stuffing when ready to serve. *Can substitute chicken breast cutlets if desired but I think the thighs are amazingly flavorful and moist. They’re kinda my favorite weeknight protein right now. I'm so making this for dinner tomorrow since i have the thighs sitting in my freezer may top with cream of chicken and milk mix as gravy thanks! Yes, I think I will use soup and milk also as I'm not fond of jar gravy. I would like to use the soup and milk mix. How much milk do you add? A can full? This reminds me of a dish my Mom always made. She would get deli chicken or turkey, have it cut kind of thick and make the stuffing to roll up into it, pour the gravy on top and bake. She would bring these to reunions and picnics all the time and always brought home an empty dish. Sometimes the simplest things are the best! Can you tell me which jar gravy you use?I have not bought jar gravy before and I imagine there are some that are better than others. Oh Lord, I'm not sure. I think it was Heinz. Made this for dinner a couple of nights ago. It was simple to prepare, and my kids and I loved it....thanks for sharing! Could you use small chicken breast for this recipe also? Yes, but you'll want to pound them out thin into cutlets so they will cook through and be big enough to stuff. I made this for the first time last night. I made my own gravy but did use Stove Top. It was ok. No one in my house is (evidently) a fan of Stove Top. LOL I will definitely be doing this one again, but I think I'll make my own dressing and see how that goes. Hub said there was too much gravy too, so next time I'll cut back on that. This is actually the first recipe of yours I've even needed to tweak. That is a rare thing for me. I usually have to tweak just about EVERY recipe. And the tweaking here will be minimal. I try to stay away from processed foods as much as I can. Those preservatives are scary. So is the chicken around the stuffing or is the stuffing around the chicken? I want to make this tonight, but am a little confused. LOL! Both! You wrap some in the chicken to make a little bundle then spoon the rest of it around the bundles. Good luck! Why does the chicken look like it's setting on top of the stuffing. I'm a little confused about the "putting the stuffing on top of the chicken". It doesn't look that way to me? Each bundle is stuffed with stuffing then the extra is spooned around each piece. I don't know what you mean about "putting the stuffing on top of the chicken"? That's not part of my recipe. Hope I answered your question at least! Mandy, your recipe looks yummy. i should have paid closer attention to the recipe before going grocery shopping. I bought the pepperidge farm bagged dressing instead of the stovetop. will it work just as good? i have never used any bagged stuffing mix before, and i got the big bag. I keep seeing comments about the carmelized onions, but there aren't any in the recipe? It was in the comment on FB that accompanied the recipe. Also above the picture, there is mention of onions. There are no caramelized onions in this recipe. If someone indicated that there were on FB, it wasn't me. I loved this! Simple but yummy and lots of ways you can change it up. Great weeknight meal. Thanks! This is so easy and yummy. the first time I made it I added cranberries to the stove top dressing. Tonight I am adding chopped apples. Serving with smashed potatoes and sautéed asparagus. I make something very similar to this and it is delicious. I season the chicken with garlic powder and Mrs. Dash Garlic and Herb seasoning, and cover it with Campbell's Golden Mushroom soup. It also works well with thick cut pork chops! This is OK if you're in a rush and need to get something done ASAP.......... but this is *not* cooking. Even a trained monkey can throw a couple of cans/jars/boxes of stuff and some meat in a pan and come up with something..... but that's not 'cooking'. I stumbled upon your site yesterday and have been reading the recipes and comments ever since. Everyone has been so nice and amusing until....the 09/01/15 post. How rude! My mamma always told me, "If you don't have anything nice to say, keep your d*#n mouth shut!" My daughter has spent the last 10 years on her career instead of in a kitchen learning to cook. Consequenlty, as a beginner, she needs recipes like this which are quick and easy and excellent! Beginners have to start somewhere but that does not make them trained monkeys! I have been cooking for 40 years and even I need some new ideas and new twists on old favorites. So thank you for posting tasty and creatative and easy recipes that I'd like to see a trained monkey attempt! Where would the world be without us southern girls and our sweet tea?